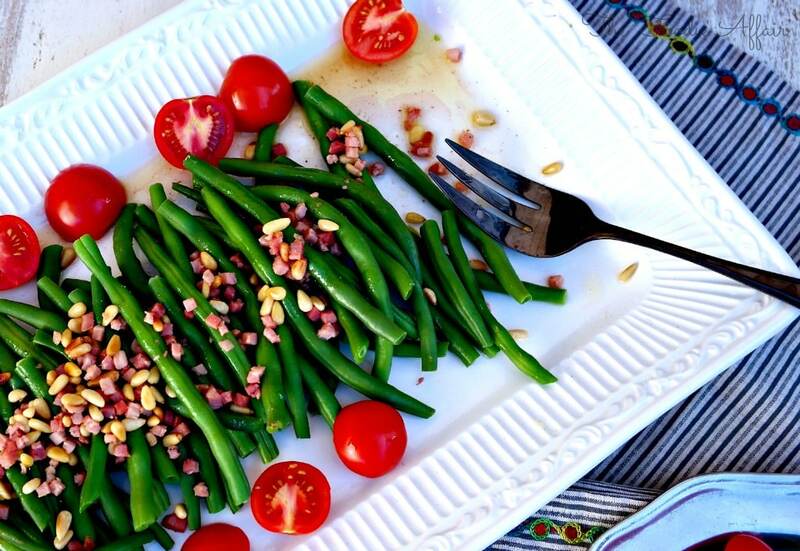 Fresh green bean recipe with prosciutto topped with pine nuts and a warm vinaigrette for your holiday meal! Have you started organizing your Thanksgiving menu? Do you stick with the same foods year after year or do you like to try new dishes? 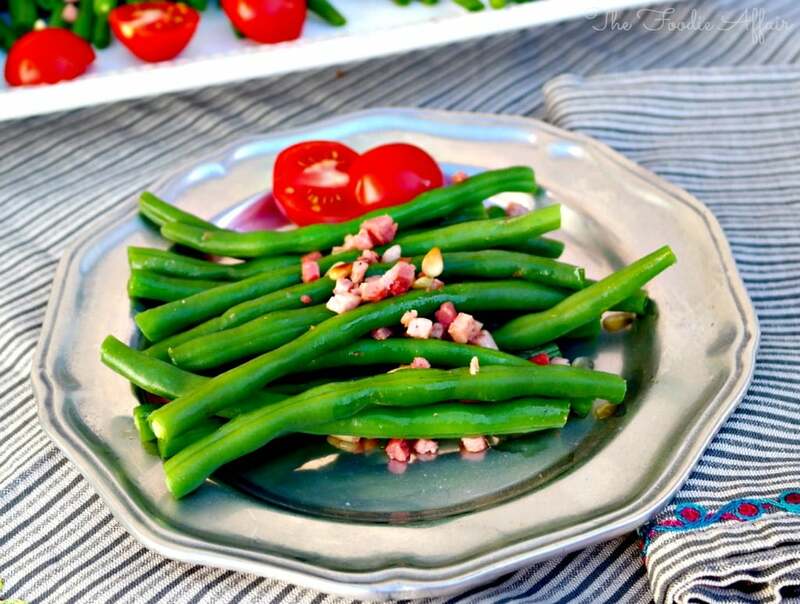 This green bean salad has been making an appearance on our Thanksgiving table for over 20 years! My mom made this recipe from one of her Food & Wine Magazines back in the late 80’s and I have continued to make it for my family. The original recipe tops the beans with bacon, which is DELICIOUS, but with so many other foods being served for Thanksgiving dinner I use Prosciutto, which adds the same delicious salty flavor that bacon has, but we’re skipping the greasy clean up! There is nothing like fresh green beans! I like them steamed just slightly so that they hold their form and have a nice crunch to them when you take a bite! Don’t expect leftovers. This platter of green beans is always is cleaned by the end of the evening! If you need more recipe ideas for Thanksgiving be sure to swing back by! Twelve bloggers are hosting a Progressive Thanksgiving Dinner (I’m sharing these green beans)! Swing by now!! Toast pine nuts in a skillet over medium heat until golden brown (watch carefully). Set aside. In a large sauce pan of boiling and salted water, cook the beans until just tender (about 5 minutes). Drain and rinse with cold water to stop the cooking process. Arrange on a platter and place tomatoes along the sides. In a small skilled saute the prosciutto. Add the olive oil, vinegar, sugar, salt and pepper. Turn the heat to medium-high and bring to a boil and cook until the sugar has disolved. Add the pine nuts and pour dressing over the beans and tomatoes. Serve immediately. Green beans are always on our table at Thanksgiving. I think my mom would walk out if I didn’t have her beloved green beans haha. 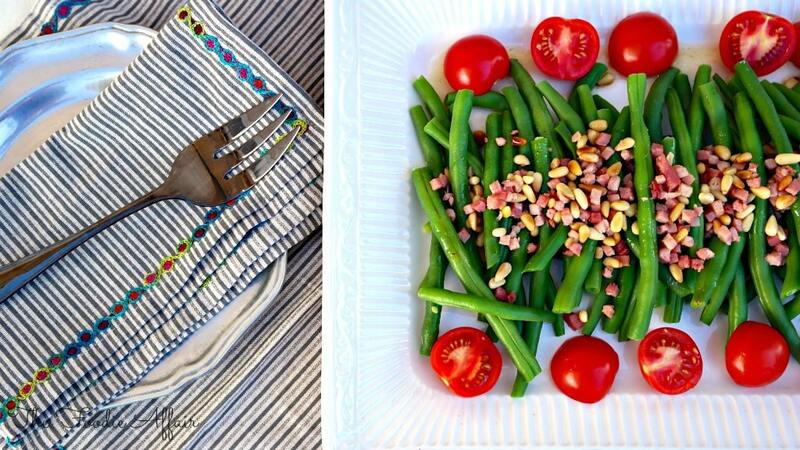 This recipe looks delish with the pine nuts and prosciutto yummm! These green beans looks so fresh & bright! 🙂 And I LOVE the addition of the prosciutto! Thanks a bunch! The prosciutto adds the perfect amount of salt! First of all, gorgeous photos!!!! Second of all – I love green beans and just bought some the other day – would love to try these! So pretty! What a lovely holiday side! 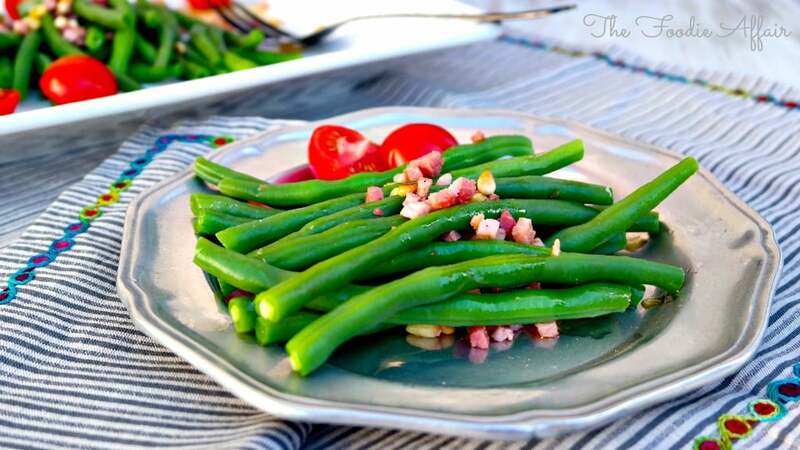 Green beans are always served, so I’m looking for a new recipe and this looks delicious! Thanks, Erica! I hope you give this recipe a try while we have fresh green beans available. I vote for the Prosciutto, love your presentation, very festive. I’m pleased with the switch from bacon to prosciutto, and I’m glad you agree! Yummy! I love fresh green beans! I like adding lemon juice to them as well but proscuitto sounds amazing. Thanks, Amanda! 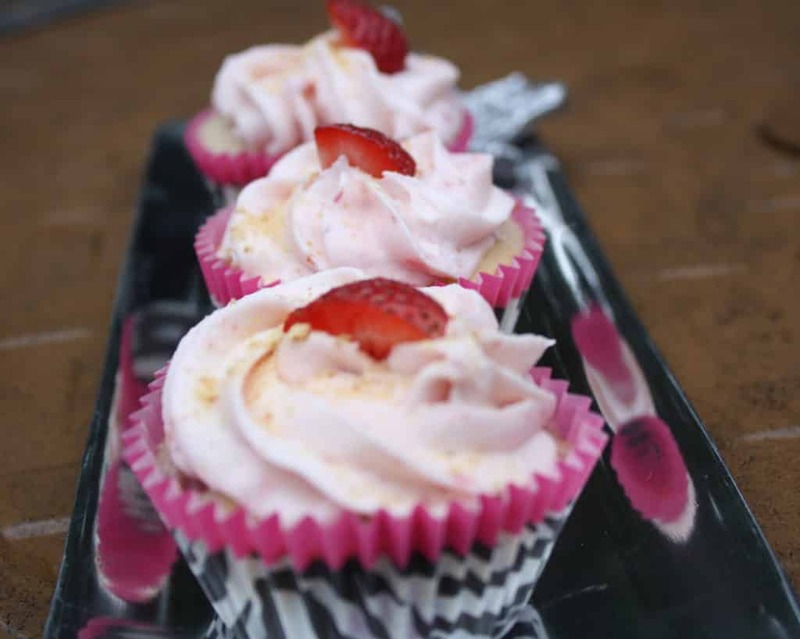 The flavors work well together, and I think a splash of lemon juice would be perfect as well! I honestly think I like crsipy Proscuitto better than bacon! WHAT? lol It’s true. These beans look like an excellent addition to any meal! LOL, I know! 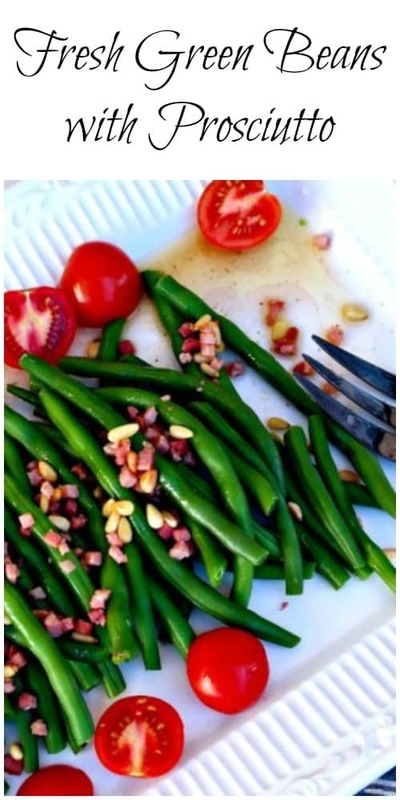 Bacon is just fabulous on everything, but I think the Prosciutto is better on these green beans. Fresh, vibrant and delicious! I love them! Fresh green beans are the best tasting veggies! Such a fresh and pretty addition to the feast! Great combination of flavors. These would pack up nicely too if anyone is too full for dessert.